I can imagine what went through this sign-writer's mind. 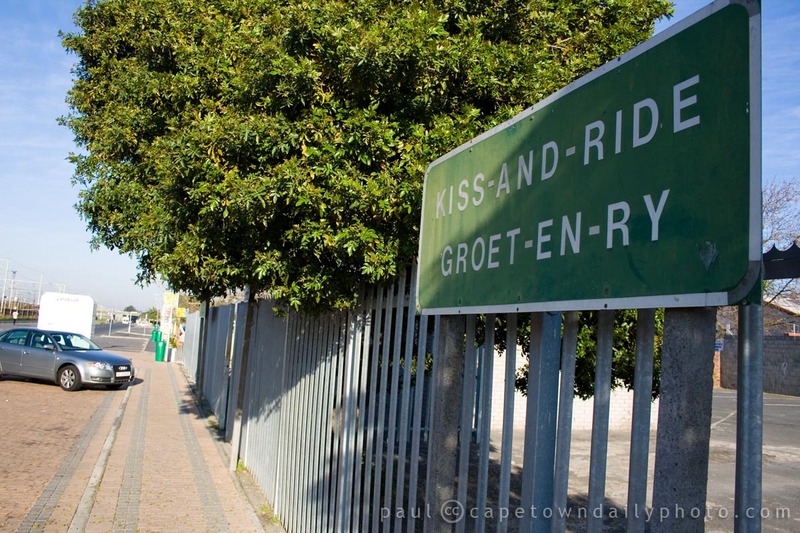 The Afrikaans version "Groet-en-ry" literally means "Say goodbye and drive away" - although in Afrikaans the statement doesn't convey the same harsh tone as the English one does. I imagine that, at the time, the sign writer must have decided to go with a softer approach. I'm sure they must have visualised people dropping off loved ones and kissing them goodbye - and I'm guessing that was how the softer "Kiss-and-ride" phrase was born. Posted in General and tagged sign on Saturday, 28 August, 2010 by Paul. Paul, I can see that you a Kerry-Ann does not have kids. You do not just drop of your little ones at school. There is all this good-bye kisses that must happen and if the mom’s are not given gentle reminders to move on then this can take a while, while the queue behind them gets longer and longer as other moms wait to drop off the loved ones. Drop-‘n-go is for that time when you in a rush to catch a plain. This sign is fantastic !!! of course “Drop-n-go” should be the correct one, but I would have liked better “kiss-n-go” it is more loving. I saw a very funny sign once in New York City on the 6th Av. “don’t even think to park here” . This gives you immediately the idea that parking is prohibited, no doubt. Hi there – nice blog! Just wondering where this photo was taken? Thanks Michelle. The photo was taken in the parking area of Brackenfell train station. Right over here.